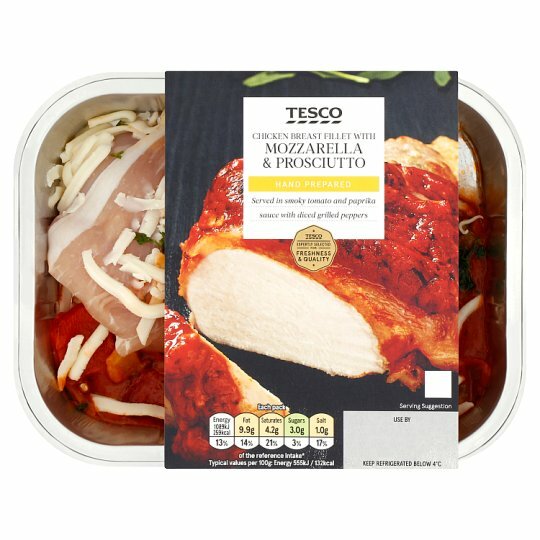 Skinless chicken breast fillet with grilled peppers in a tomato and paprika sauce, topped with grated mozzarella cheese and prosciutto crudo. Chicken Breast (62%), Tomato and Paprika Sauce (16%), Mozzarella Cheese (9%), Red Pepper, Yellow Pepper, Prosciutto Crudo (2.5%), Parsley. Tomato and Paprika Sauce contains: Tomato, Rapeseed Oil, Tomato Paste, Water, Onion, Red Wine Vinegar, Garlic Purée, Cornflour, Sugar, Salt, Smoked Paprika, Concentrated Lemon Juice, Parsley, Red Chilli Purée. Mozzarella Cheese contains: Mozzarella Full Fat Soft Cheese (Milk), Potato Starch. Prosciutto Crudo contains: Pork Leg, Salt. Instructions: 190°C/Fan 170°C/Gas 5 25 mins Place foil tray on a baking tray in the centre of a pre-heated oven for 25 minutes. Defrost throroughly for a minimum of 16 hours in the refrigerator. Caution: Although every care has been taken to remove bones, some may remain.Caution: This product contains raw meat.Packaged in a protective atmosphere.